This Intedge Grabber Pad can be used in a variety of kitchens ranging from home, to school, even to commercial. Never worry about dropping it just before you grab a hot pan. 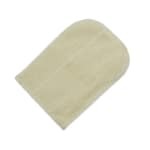 This Intedge terrycloth Pad is equipped with wrist straps to secure them in place during use. For further protection a steam barrier has been added with the consumer's safety in mind! Terrycloth baker's pad with steam barrier and wrist strap. Used in school kitchens, bakeries, fast food restaurant, and institutional kitchens. Approx 8-1/2" x 11", Natural. San Jamar 803PG Pan Grabber, Baker's Pad w/ Wrist Strap, 8.5 x 11"